All Undergraduate Students, Graduate Students, Alumni, Faculty and Staff from Tarleton State University are invited to join Tarleton State University Portfolios — an exclusive network powered by Portfolium — to gain valuable exposure for your work and projects, connect with members of the Tarleton State University network, and be discovered by potential employers, recruiters, and classmates. Browse the gallery to discover great talent across all fields of study. 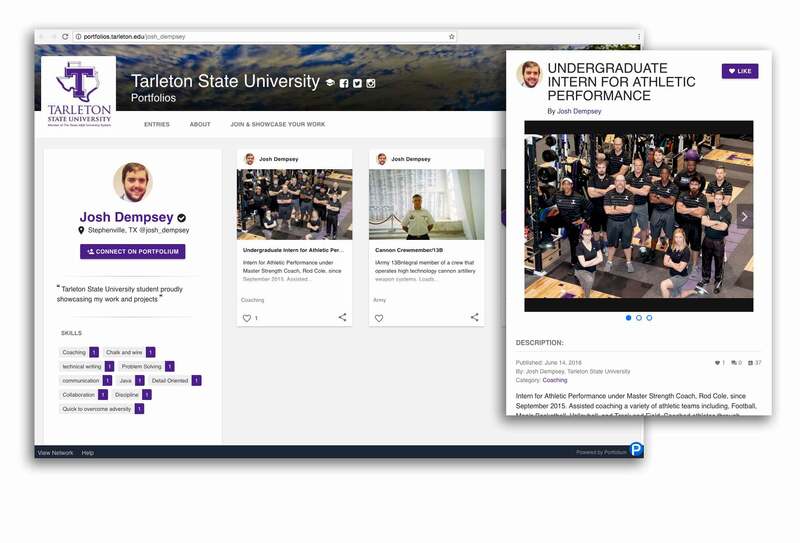 Search portfolios and connect with students and alumni. Filter by field of study and other criteria. Be inspired by the work and projects of others. Find friends and classmates by name or school. Showcase your work to classmates, employers, and the world. Manage your online portfolio and sync with LinkedIn and other sites. Import content from sites like Dropbox, Google Drive and more. Embed your work on blogs and across the web. Gain exposure everywhere your work appears. Follow and tag the portfolios of your friends and classmates. Follow the top companies in the world. Submit your work and projects directly to hiring managers. Bring your portfolio into job interviews and career fairs.